The decision to leverage Platform-as-a-Service (PaaS) is not a difficult one for many organizations, as it offers cost savings and allows more time to focus on designing and coding. But while PaaS may be the preferred choice for new projects, it may not be a good fit for existing, legacy development efforts. How do you know when to leverage PaaS? What should you know about choosing a PaaS vendor? 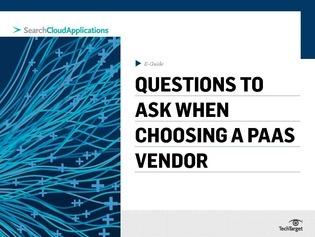 Cloud computing business consultant Jeff Kaplan answers those questions and more in this expert e-guide, where you'll learn essential questions to ask when choosing a PaaS vendor. Also, read on to discover five things to consider before moving legacy development efforts to PaaS.